The problem between the Brown-hooded Gull and the Grey-hooded Gull arises when they are not breeding since they lose the hood, which is the most evident feature to tell them apart. At first glance they may seem all the same. Only a patient search will confirm this since the Brown-hooded Gulls outnumber the Grey-hooded Gull 100 to 10. These photos were taken in the ponds in 2007. At that time big flocks were seen from more or less May to July. During the rest of the year only small groups were spotted. Today they can be seen on the coast or flying by over the reserve. As general information: there is a difference in size, the Grey-hooded Gull is 38 cm and the Brown-hooded Gull is smaller (35 cm). This can be appreciated in ideal conditions. As far as habitat and behaviour go there are no differences between these two species. They emit different voices, but the numerous Brown-hooded Gulls' cries cover those of the Grey-hooded ones. The two gull species in whole hoods are easily told apart. The dorsal pattern of the wing is also different. The black band near the wing tip is more extensive in Grey-hooded Gull. Clic on photo to enlarge. 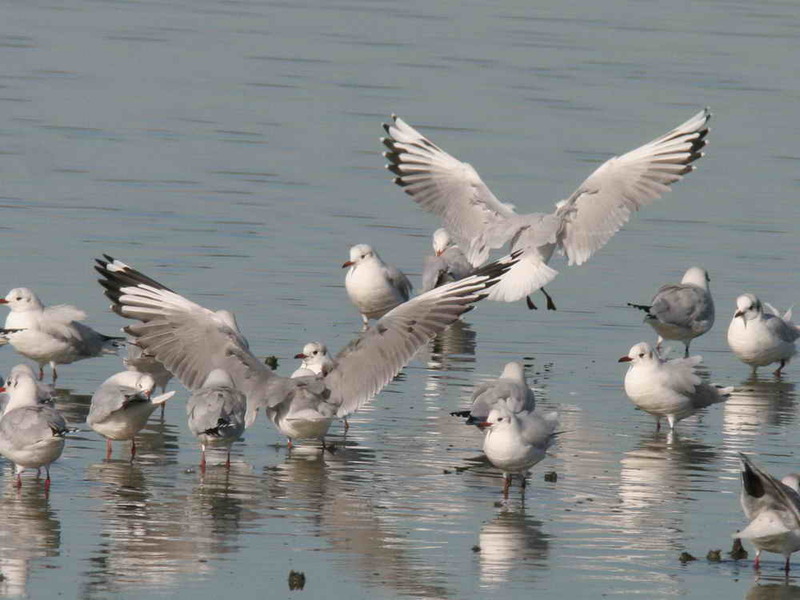 In this case we compare the Grey-hooded Gull with the surrounding gulls. Colour of iris, colour of the back and the black-white distribution on end of wings stand out. We can even say it looks bigger than the rest. To look for differences in a photo is easier than on the field, but this training helps to develop an eye to know what to pay attention to.